32 available 32 items in stock. 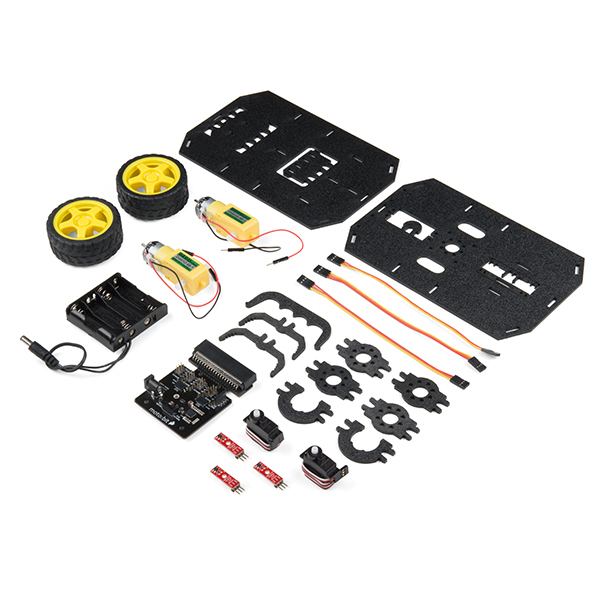 Inside each micro:bot kit you will find all the components required to build your micro:bit into a robotics powerhouse; the only part that's not included is the micro:bit itself. Simply add your own micro:bit to the provided moto:bit, assemble the kit, and you will be ready to start moving. 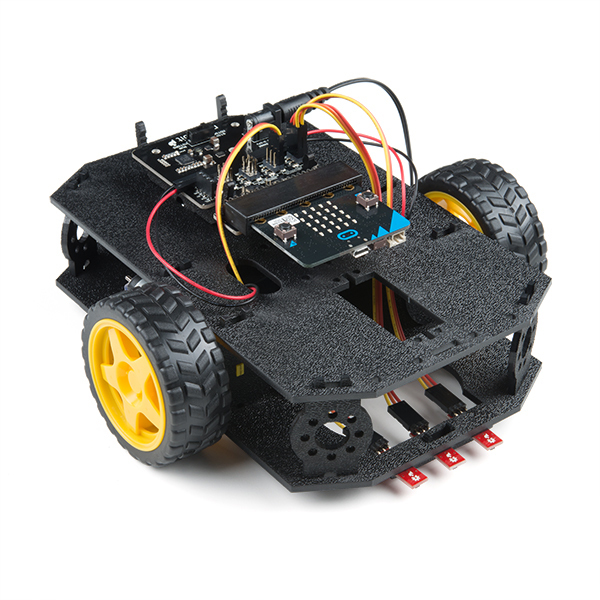 The SparkFun micro:bot kit is a great way to get your feet wet in the world of robotics. 3x Jumper Wire --- 3-pin, 6"
Is this kit easy to disassemble and reassemble? I'm hoping to use this in a group setting over and over again and wondering how it will hold up over time and if the parts disassemble easily. The micro:bit is a great tool for students to use. Easy to use with lots of functionality. The Shadow chassis is a favorite for a good reason: it works, and it adapts well to many different controllers. The micro:bot edge connector is a little awkward in placement with regard to the cables for the line sensors (initially installed the bit, then flipped the board around in the mount and ran the cables over the bit so they would reach), but a little 3d-printed part should remedy this. Having a ready-to-go servo setup is nice as well, as it means I can attach a gripper arm (also made from printed parts) to the front. The larger servo slot means that, instead of a gripper, I can also make a 3d-printed rubber band cannon! All in all, a great little robots package for the micro:bit. Would love to see some in STEM workshops! If I could leave zero stars I would. I filed a issue with Tech Support close to 30 days ago as the chassis is defective. No word from Sparkfun Tech Support. Two emails later to follow up and still no word. I cannot bring myself to make a purchase although some great items have come out - there is just no customer support here. Since I haven't been able to put it together, I cannot even give a review of the product. Sorry about this. Our techsupport should have gotten back to you within a couple of days. Please double check your Spam folder and I'll make sure to forward this on to them. Hello Member #792634. We've tried answering your questions on three occasions but it appears you're not getting our emails. Please check your spam box for those. If you still have an issue after reading our responses, let us know and we will help you. You might need to white list techsupport@sparkfun.com in your email program to avoid our responses going to spam. This kit is really good for a number of reasons. I have bought a total of three of these kits. Two of them have been assembled in an after school enrichment class at my wife's school. The kids range from 3rd to 5th grade. The only issue the kids have had with the assembly has been some of the parts take a stronger hand to press together than some of the little one's can muster. But it is not a big deal. That is part of learning. The third kit will be used next semester when we start the program again. I plan to buy more of these if you ever get them in stock. I had hoped you would have had them in stock for the cyber Monday sale. A colleague and I tried twice to get it working but couldn't We just ordered new gear motors from a third party to try again. The parts fit together well but there is either something in the coding or the way the motors are responding that is off. This model needs some tweaking, SparkFun. Sorry to hear you're having trouble with the micro:bot kit. Please send and email to our technical support team at techsupport (at) sparkfun (dot) com and we can help! My students love the micro:bit kit. We are learning to code and along with some robotics. These kits have been a big hit. I only wish I could have got more kits. Clear instructions, good performing parts and scratch library for the board makes it pretty easy to use. I purchased this for my grandson which has Asperger's syndrome for Christmas. hoping to give him something special to help him develop a trade or skill that he may enjoy and can put to use in his future. Not sure of what he would like to do. He wants to be a military scientist. This may help. This is an impressive kit. It contains everything you need to build the robot chassis (motors, frame, some sensors) and a breakout board to connect a BBC micro:bit. This combo is really powerful, since the micro:bit has a solid amount of sensors onboard already. The chassis is sturdy and easy to configure. The motors are powerful and fast. However, the highlight is the breakout board, and the integration with the micro:bit. The board breaks out 2 drive motor connections, 2 servo connections, 6 sensor inputs, and an I2C connection. Together with the sensors on the micro:bit (accelerometer, compass, light and temp), you can build a VERY capable robot easily. To compare, a Lego Mindstorms EV3 supports 4 motors and 4 sensors. This thing supports 4 motors, 6 sensors on the breakout board AND 4 sensors on the micro:bit itself. The I2C port is compatible with Sparkfun's Qwiic system, so you can add a bunch of stuff that way too - I've attached an MP3 player. Radio communication between micro:bits (or between micro:bits and a phone) is easy, so it is straightforward to create your own remote control using another micro:bit. This is really helpful, and provides the possibility for kids to create their own control interface. The only change I would request is the possibility of accessing full battery power easily, for driving 5v sensors and accessories. Right now I'm tapping VCC from the servo pins and putting it through a 5V voltage regulator. I feel the kit is overpriced for how it is designed but it is still a great intro to robotics and a fun addition to a micro:bit collection. I'd like to see a kit in the low 100's that uses micro:bit as well as more resources to go a little deeper. Thank you for the feedback, we will pass this onto our product design team.